Kim Robinson, PharmD. is a 2017 graduate of Washington State University College of Pharmacy. 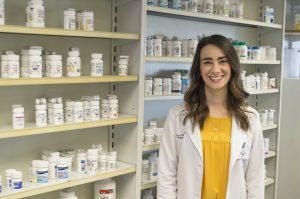 She has worked in independent pharmacy for eight years while she was an undergraduate and pharmacy student. Kim strives to maintain personal relationships with her patients and brings a new and innovative perspective to the Family Pharmacy team. Kim is married to Max Robinson who is a pilot at Columbus Air Force Base. Together they are active members of Vibrant Church.